Many organic reactions you encounter have very practical uses. In this section, we will describe the organic chemistry of carbohydrates. Sign up today with StudyOrgo to see more illustrations and easy explanations to make your Organic Chemistry studying a success! Carbohydrates, or saccharides, are molecules of 3 carbons or more which contain at least one carbonyl group and one alcohol group. Carbohydrates containing an aldehyde group are referred to as aldoses while carbohydrates with a ketone group are referred to as ketoses. Like all organic molecules, stereochemistry is an omnipresent consideration. Recall that chiral, non-superimposable, mirror images will rotate plane-polarized light to the left or right, referred to as S and R respectively. In carbohydrate chemistry, left- and right- rotation is referred to as L (levorotary) and D (dexorotary), but their meanings are exactly the same! Remember that chirality is a key to life; as a matter of fact animal cells are only capable of utilizing the D-isoforms of saccharides while the L-isoforms are not metabolizable! The simplest carbohydrate is glyceraldehyde (C=3) which has 1 stereocenter, therefore it has two enantiomers. C=4 carbons have 2 stereocenters and two different arrangements of the OH groups, named Erythrose and Threose (diastereomers), but each has a mirror image (enantiomers), thus resulting in 4 stereoisomers. C=5 carbons has 3 stereocenters, thus giving 8 stereoisomers, the 4 diastereomers referred to as ribose, arabinose, xylulose and lyxose. Remember, for each OH arrangement, only 1 mirror image (the enantiomer, D or L) exists! 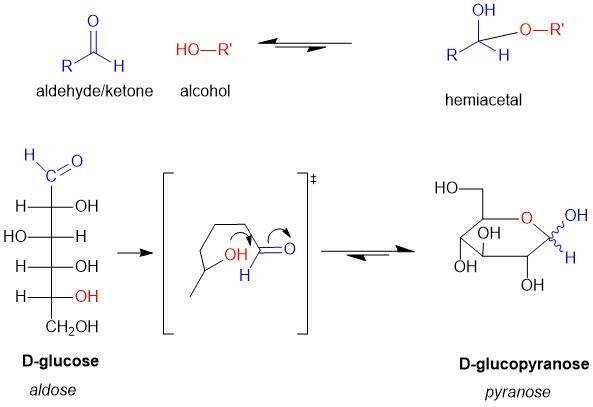 Recall hemiacetal formation, which is the reaction of aldehydes or ketones with an alcohol to produce the hemiacetal functional group. You will also recall that inter-molecular hemiacetal reactions are unfavorable. However, intra-molecular hemiacetal formation, which is possible in carbohydrates, is very favorable (Figure 2). Thus, carbohydrates are typically drawn as a Hayworth projection. The aldose or ketose when cyclized is renamed to resemble the molecule pyran (5 carbon cyclized ether) or furan (4 carbon cyclized either). Thus, for D-glucose the cyclized version is renamed D-glucopyranose to indicate a cyclic structure. The ‘pyran’ is usually dropped in the vernacular of biochemistry but is an important distinction to make for the exam! The alcohol formed from the hemiacetal reaction is an important functional group in the organic chemistry of carbohydrates. This carbon center, usually at position C1 or C2, is referred to as the anomeric position. It is also a stereocenter, and the resulting enantiomers are referred to as anomers. When the OH is pointed above the plane of the ring, it is referred to as the beta- configuration while the OH pointed below the ring is the alpha- position. All monosaccharides contain an anomeric carbon! Equilibration back to the aldose or ketose makes the carbonyl susceptible to oxidation by reagents, such as silver nitrate, the main component of Tollen’s Reagent. This reaction converts the carbonyl in saccharides to a carboxylic acid. In the process, silver precipitates to form a mirror-like residue on the beaker. Thus, any saccharide that tests postive in this reaction must have an anomeric position that can equilibrate to the aldose or ketose configuration and is said to be a reducing sugar. Reducing sugars are useful carbohydrates in making polysaccharides, or polymers of carbohydrate units involving the formation of glycosidic bonds (Figure 4, sucrose red oxygen). 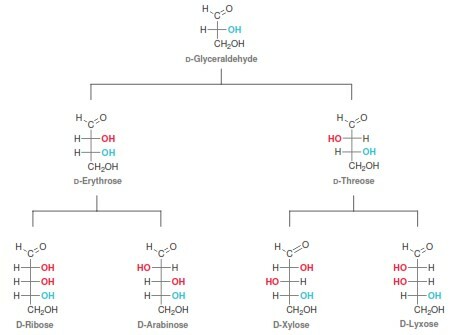 However, when the anomeric position between two saccharides are linked together, the anomeric postion (also known as the reducing end) on both sugar units is unavailable. Take for instance sucrose (table sugar); it is a disaccharide of glucose and fructose. 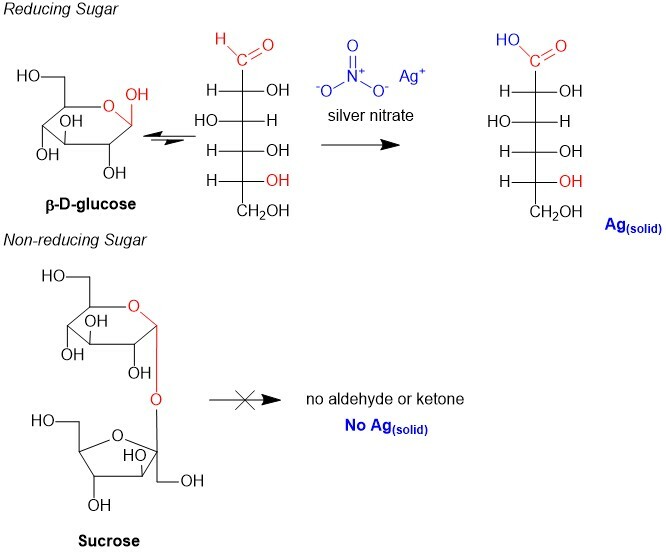 However since both reducing ends are used in the glycosidic bond, they will not react with Tollen’s Reagent, thus sucrose is said to be a non-reducing sugar.